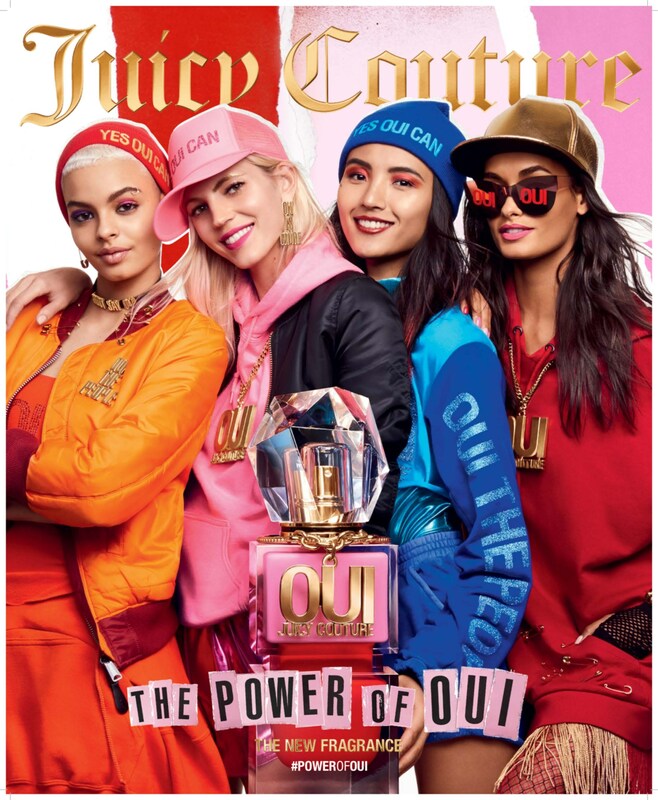 Iconic Los Angeles fashion house, Juicy Couture, along with leading global beauty company Revlon, launches the campaign for the new fragrance, Oui Juicy Couture, featuring Brand Ambassadors Devon Windsor, India Graham, Gizele Oliveira, and Luping Wang. Shot by famed photographer, director, and illustrator Quentin Jones, the edgy pop-art-esque campaign is refreshingly modern and expressive, bringing to life the #PowerofOui through wild textures, bright colors, and larger-than-life Oui Juicy Couture maxims. Featuring the members of the Oui Juicy Couture squad – Devon, India, Gizele, and Luping, each ad and video displays their distinctive versions of the playful, take-no-prisoners Oui Juicy Couture attitude. Designed to be equal parts playful and provocative, Oui Juicy Couture is a show-stopping, wear-everywhere fragrance packed with innovative ingredients. The scent pops with the tart juiciness of Waterlemon Accord and Acai Tea Accord. The two notes balanced with the infusion of fresh Pear create an addictive opening like no other. Wild Tuberose, Jasmine Buds Absolute and Dewy Honeysuckle create a floral bouquet that radiates playful femininity. Amber Resins and Captive Musks anchor the unique Techno Woods Accord for an edgy finish that lifts the entire composition. The Oui Juicy Couture bottle makes a statement with its contemporary decanter-style shape and one-of-a-kind dual color glass. While the soft pink and fiery red-orange combination is unapologetically feminine, the oversized gold chain and logo pendant draped around the neck give the design a playfully provocative feel. Finished with a modern crystal topper, the bottle is as elegant and edgy as the Oui Juicy Couture Girl herself. Experience The Power of Oui. View the campaign video now on @juicycouture’s Instagram page. Oui Juicy Couture is available now at Macy’s, and beginning August 6 at Ulta.